Have you ever heard someone else say, “I can’t wait to get my black belt”? Perhaps you have said it yourself. Personally, I believe the correct way to say it would be, “I can’t wait to become a black belt”. Each time, while trying to remain humble, a smile escapes my face. There is nothing wrong with a feeling of pride over your achievement, and to be a black belt is just that, an achievement, not a title. Allow me to make my point. Whatever your perception of a black belt, try to forget about the title or the idea of ‘getting‘ a black belt. Instead, focus on ‘becoming’ one. Although it is only a tiny difference in vocabulary, there is a fundamental difference in their mindsets. The focus of “getting” leads to a number of incorrect karate-do attitudes. These are: » By focusing on the belt, you are surrendering control. When our next belt is the primary focus, we think about the number of classes we must do and we think purely about the aesthetic appearance of our Kata. In karate, attitude is on an equal par to ability. Most would agree that there is no sadder sight than a black belt with a bad attitude. Generally speaking, in GKR, a student with a bad attitude would not be sent to grade. However, on rare occasions, a black belt’s attitude becomes riddled with disease, and while they wear a black belt, it could be argued that they are no longer truly a black belt. This implies that you are bringing the focus back onto yourself, therefore remaining in control. This focus is vital, as a belt, in essence, is nothing more than a by-product. A by-product of who you have become, the effort you have put in and the ability you are now able to demonstrate. Self-focus works like a paradox; if you want the best, forget about the belt, just train to be the best you can be and the belt will come to you. As previously discussed, karate is as much about virtue and character as it is about learning how to punch, kick and perform sound Kata. Let me explain the virtues that I personally look to develop in potential black belts training with me. 1. A desire to be excellent. It may sound obvious, but I have seen a lot of people (usually found whinging or complaining) who are preoccupied with getting a belt rather than working to be a great karate-ka, thus deserving one. They argue they have done the adequate number of classes or served their time. This path will only lead to frustration and negativity. Focus on improving your ability. Take responsibility for each part of your training. If your back leg is bent in forwarding stance, lose the excuses and fix it. Also, focus on your effort and your character. Genuine desire to become a great karate-ka is the most crucial determinant of whether you will achieve your black belt, and for most karate-ka, all too often it is overlooked. A burning desire is what underlies your training ethic and clarifies your goal of who you want to be. 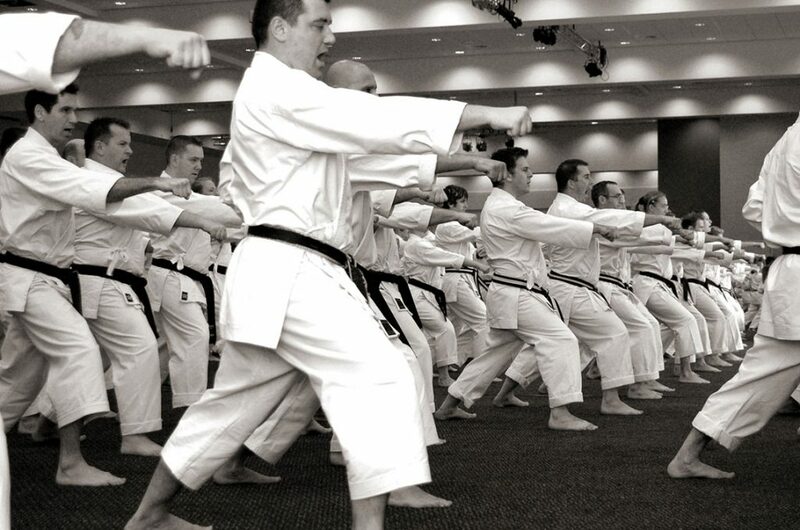 Without a goal (an idea of the karate-ka you want to become), how will you train to achieve it? What will push and drive you in your training if you don’t have a goal in mind? Bruce Lee said, “Achievement of anything begins in the mind”. Lastly, now that you’ve decided what you are going to achieve and are focused on your goals, resolve to pay the price to achieve them, whether that’s doing an extra class, training at home, or eating better. Preferably write down your goals along with your plans of how you are going to achieve them. A black belt must have drive and spirit. Training hard when you feel up to it is not a spirit. Great karate-ka develop discipline, which is the ability to carry on with a resolution long after the mood in which it was made has passed. To be a black belt you must learn to love a good hard class, not just because you like the pain, but because you have strong goals to get fitter and stronger mentally and physically. When you have a goal, it’s not ‘work’, it’s enjoying the satisfaction of achieving. Shihan Anthony Ryan often says that “Character, like the Samurai Sword, is forged between the hammer and the anvil, not between flowers and pillows”. The best thing about discipline in the dojo is that it teaches you the value of pushing yourself and stretching yourself out of your comfort zones so that you can grow. A good black belt should have a determination about them when they train because they have learnt the value of pushing themselves so that they can grow. If Black Belt Certificates were found in cornflakes packets, would you put one on your wall? Would it mean anything? A black belt is made special by the sweat and tears that went into its achievement. 3. Think about your karate. Training hard is not enough; a karate-ka must also be a thinker. You cannot always rely on your instructor for advice on how to improve your karate. You have got to be thinking about what you are doing to develop self-awareness, so you can minimise your mistakes and create good technical habits. Think also about ways in which you can improve in your karate. Thinking is nothing more than asking yourself questions and then answering them. The trick is to ask the right questions. Don’t ask negative questions like, “Why can I never get this right?”, “Why can’t I do that?” Ask questions that are looking for a positive solution, like, “How can I make this better?” “What can I do to get this to be even sharper?” Some great questions to ask yourself while practising Kata are, “How can I use my hips and centre of gravity more?” “What can I do to get this move faster?” “What is the most important thing I could do to look sharper in this sequence?” By the way, don’t just ask yourself, ask your instructor as well! Kumite is another great area that demands thinking. Thinking both about how you can train to improve your Kumite, and thing on your feet while practising. A black belt must have the ability to change and be adaptable in Kumite. That is they must be able to see if a strategy in Kumite is working, and where it is not, to change it. If you only have one strategy and limited combinations and defences, Id start by developing more. Achieving your black belt is a personal journey, one in which you should be focused on what you want from it. One of the biggest traps of poor thinking a student can fall into, is looking sideways at everybody else. Forget everybody else and focus on your karate and your training. If you suffer set backs focus exclusively on what you can do to improve. Michael Jordan learnt a life changing philosophy from legendary basketballer Doctor Jay, it was, “Hold yourself to a standard higher than anyone else could expect of you, that’s how you become great”. In order to achieve a black belt you cannot aspire to, or even accept being adequate. A black belt should always be striving to be the best they can be. I once had a discussion with a student who said their legs in sanchin-datchi were actually bent, but their gi trousers hid the bend. I questioned how bent they were if their gi trousers could hide it? In becoming a black belt you must commit yourself to mastery. So if your karate is adequate or good or even great, it should still be in your mind set that it’s not good enough. To be a black belt you should be an example of humility. This is not saying you are not proud of your abilities or your accomplishments, it simply means you don’t boast about them or become arrogant. Once at the end of a black belt grading I overheard someone who had just failed (they were a bit emotional and they were proclaiming to their peers), “It doesn’t matter, I know I’m a black belt”. As soon as they said that I thought, “No, you’re not”. I thought this not because they had just failed the grading, but because a true black belt should never be so arrogant as to proclaim to be something they haven’t yet become. There is also a very egotistical implication there that they were not at fault, their assessors made a mistake. The correct attitude would be to walk away from the attempted grading thinking to themselves, “What can I do to improve and get better so I pass next time?” Incidentally the person who said they knew they were a black belt in spite of failing didn’t change and didn’t improve (because they thought they didn’t need to) and consequently were not even sent to the next black belt grading.